March 9, 2004 was diagnosis day. My diagnosis of Type II diabetes was quite unexpected. I was not aware then of a family history of diabetes, and had not noticed any symptoms that suggested diabetes. Most of all, wasn't I still the skinny kid with a sweet tooth (just a tad overweight at the moment perhaps) who could eat as much as he wanted? They told us about these symptoms in Diabetes Education Class 10 days later. Type I, I learned, used to be called Juvenile diabetes because its onset was mainly in children and youth, caused by the loss of the insulin-producing cells in the pancreas. Now so many younger people are getting obese and being diagnosed with type II diabetes that it is no longer called “juvenile”, but Type I. In Type II diabetes, your insulin -producing cells still work at least somewhat, but your body cells become resistant to the insulin in your blood. Thus, glucose builds up in the blood and can cause serious complications. I had to admit, however, to having more infections than usual during the previous 2-3 years, and was in the doctor’s office because of two infections at once. But my blood sugar was found to test out at 9.6, according to the accurate A1C test. Unlike sticking your finger and testing your blood at the moment, whether you just ate or not, A1C averages the glucose in your blood over the last 2-3 months. That 9.6 was not good, because at that time we were supposed to keep it under 7.0. Now, with the "diabetes epidemic" hitting our country and others, that standard of blood-sugar control has been reduced to an A1C of 6.5. Also, thinking back, my maternal grandfather had a great big belly when he died of a heart attack in his 60's. My aunt on my father's side had been obese, and had had a foot amputated. I remember no talk about diabetes, at least not about our family, but it apparently was there, and on both sides. Now my kids and grandkids have to develop defenses against their greater likelihood of getting this disease. The diabetes education class, and other information, started to fill me in on the nature of this disease, and on all of the awful complications that creep up on you, debilitate you, and can leave you blind, leg-less, doing kidney dialysis, and crippled. These awful outcomes are if you do not die of a heart attack first. Diabetes, which is usually accompanied by obesity or at least being overweight (as in my case) greatly increases our risk of cardiovascular disease." I was very upset to have it, but was delighted to have found out, because now action could be taken to reduce or even prevent those terrible outcomes of letting this disease progress. In the class, I was amazed at the denial and rebellion among class members. The man sitting next to me stated that he was sure his diagnosis was wrong. As we talked about diet plans, I overheard people planning how to cheat on their diet before they ever got started on it! How peculiar! In the movie "Chocolat" Judy Dench plays a willful diabetic who would rather die than commit to a life-style change. I have met many others like the character she played. Educated in Psychology, I have become very interested in the psychology of food choice and of eating, and the management of the behavioral changes we need to make to conquer this disease. This is a juicy topic for future blogs. Being diagnosed with diabetes is dismal news, but I was blessed with a secret weapon -- Dr. Grandma!! Not only did she have the educational background, plus experience in managing diets and teams of dietitians in hospitals, but she had developed and conducted classes in weight management for morbidly obese people! She knew how to do it, and it turned out that her knowledge took us well beyond what we were learning in the diabetes education class. The results of our combined efforts were remarkable. She cooked the meals and advised on food selections when we ate out. She taught me how to count calories and proteins, fats, carbs, and fiber, which I did carefully for the crucial first 4-5 months. This is too tough a job to do regularly. I think there are better ways using new tools, for those who are up to it. But I was determined and did it. It helped temporarily to understand what I was eating, and still helps; especially, the lessons on portion size. 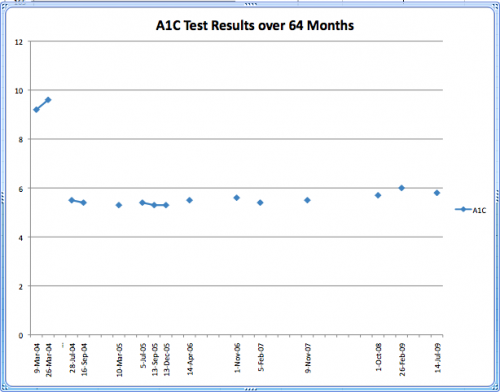 In less than five months my A1C was down to 5.5 from 9.6 in early March. My weight went down from 195 to 170, and has bounced around an average of 169 or so until a recent push to get it down to 165. You can take a look at the A1C chart. I kept a record of most of the A1C tests. They were down at 5.3, 5.4, 5.5 for four years. This last stressful year it went as high as 6.0. The latest was 5.8. The life-style change includes regular exercise as well -- at least as important as diet. The mental outlook is very positive. I love the stronger and healthier body, and have a real passion for enjoying fully the tastes and flavors of the "American Mediterranean" foods we emphasize, while not denying myself small portions of old favorites. In this post. I'll just tell you the headlines of how we did it. Commit to a life-style change. Do not expect to lose weight and get blood sugar under control, then slack off. Weight will come back, and blood sugar will rise again unless the commitment to a life-style change is met and achieved. Lose weight as soon as possible. Joyce knew how, and I learned. Reduce calories below the level you need to retain a given weight, but do not do it in a way that leaves you hungry and pitiful. Fill the stomach up first with whole grains and veggies -- natural fiber-rich foods that take up the space and give you a sense of being full. Then control the portion size of calorie-dense foods like meats and fats. The healthy Doctor Grandmas breakfasts were improved during this process, because the first meal of the day should stick with you and get you started right. When my weight and A1C went down so dramatically, our family doctor, Doctor Taylor, was amazed. He couldn't believe that I was starting many days off with pancakes, which usually are made out of refined white flour, and loaded with butter and syrup. Cut out products made with white flour, and refined white sugar. This required great creativity on Dr. Grandma's part, because, as she puts it, her first loaf of whole wheat bread "made a great brick-like door stop". People assume that whole wheat products are heavy and hard to eat. I personally resisted her gentle suggestions to get rid of my favorite white loaf from Great Harvest -- until AD (after diabetes). Spenda became my buddy because I have a powerful sweet tooth, but it wasn't good in baking, nor listed as natural. Dr. Grandma later developed her own all-natural zero-calorie sweetener that can be used in baking. It is used exclusively in the pancake and muffin mix, and our friends out there are finding many other uses for it. Make the home food environment safe. Use your will-power to arrange the environment when you are not hungry, and are powerful, then you will not have to strain your "won't power" to resist an easily available food temptation when you are weak, hungry, or having an emotional need for a comfort food. Commit to a program of exercise. As Dr. Taylor says, "You don't need to exercise every day, just on the days that you eat". Actually, I am not that good, but good enough. Enjoy the foods you eat and eat them with Gusto. Dr. Grandma makes foods very yummy, knowing that the Mediterranean diet ideal includes the whole social process of food preparation and eating -- it should be enjoyable. Some bad tasting health foods are apparently consumed "as a duty", but we want our foods to be yummy. Give yourself some latitude to eat small portions of favorite foods. At grandchildren's birthday parties, I still sample the cake and ice cream (one of my big weaknesses). We don't have to become ascetic hermits, but we have to learn great portion control. During the weight loss period, I counted calories closely, and studied how much (to me it was how little) a portion added up to a single "diabetes exchange" in the diabetes exchange lists of foods. Because we achieved the weight loss and blood sugar goals by month six, I stopped taking any diabetes medication. Dr. Taylor had prescribed Metformin, (also called Glucophage) to help reduce the high blood sugar level. It probably helped, but because of point number 1 above, it has stayed down without it, and so has the weight, for over five years now. We have found that the methods we have used successfully go further than the usual advice we have heard and read in diabetic education pieces. We have found that recipes in so-called "diabetic cook books" contain far too much sugar, white flour, and saturated fats than we find will produce the results we seek. Because of these differences we started Dr. Grandma's Whole Grain Foods, and are trying to share the good news through this website and these blogs. Happy eating and Healthy Living to you all! Hello, this is my first time i visit here. I found so many appealing in your blog particularly on how to determine the topic. Continue the good posting. It makes my day to know that you enjoyed it. » Eat Smart. Play Hard. Together!